"Hideaki Shimada who started making art and improvised violin experiments in the late 1970s in Kanazawa. As a continuation of some of these ideas, he started adding tapes, which led to the creation of the Agencement electronic project in 1985. Two LPs were released under that name, then his first CD "Viosphere" in 1991. Art into Life is now reissuing this album, plus three previously unissued tracks from the same period, under the title "Viosphere +". Of particular interest is the previously unreleased 1988 studio session with Hironari Iwata - from Toukaseibunshi from the same 80s experimental scene. Its a heavily avant-garde performance for guitar, amplifier and autoharp. Comes in a box with a 12 page booklet of performance photographs from the period and several 2011 visual works. Limited edition of 200." - Art Into Life. "Born 1962, in Kanazawa. Violin improvisation started from 1980.Started in 1985 in the solo project for the tape music which makes multi-layered violin improvisation on magnetic tape under the name of AGENCEMENT. And the live performance using amplified violin & live electronics is also performed in concert." Agencement: violin, magnetic tape, pico strings, electronics. Released 2001. 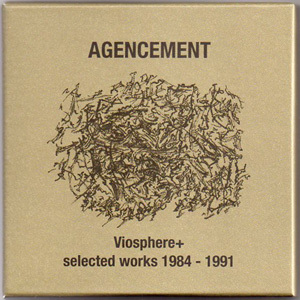 "Six Juxtaposed Works is the first release by Japanese artist Hideaki Shimada, aka Agencement, since 2001. Six Juxtaposed Works presents new pieces for violin, viola, cello, electronics, and tape. Performed and recorded between 2013 and 2017. Shimada (born 1962) plays violin improvisations since the late 1970s and formed the Agencement project in the early 1980s adding electronics and tape-techniques to his play and releasing the first self-titled cassette in 1984. Between 1986 and 2001 he published four more Agencement albums on his own Pico label. What Shimada offers intellectually is quality in limited quantity; a maximum result from a seemingly minimum effort. His work has been described as both noise and music, avant-garde and minimalism, nervous and mellow, frantic and still, hectic and calm. Includes artwork based on a drawing by Hideaki Shimada. Six-panel digipak; Edition of 300." - Tochnit Aleph.